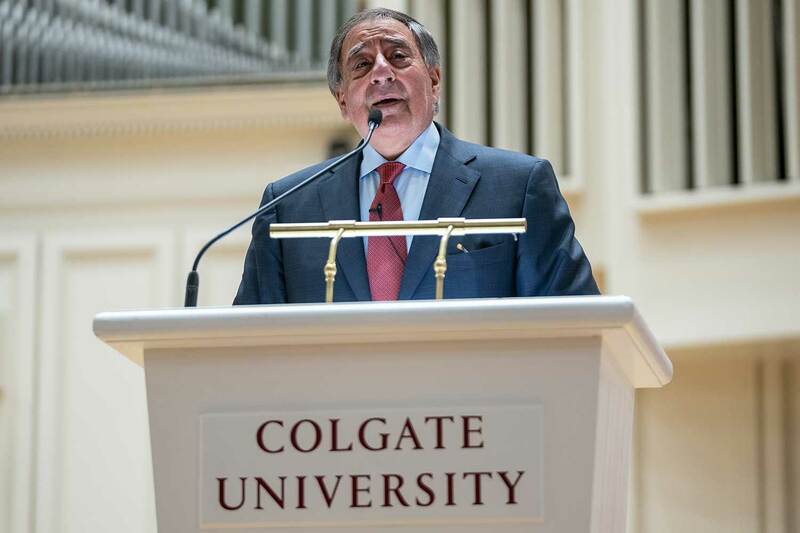 The Kerschner Family Series Global Leaders at Colgate provided the weekend’s keynote, featuring former defense secretary and CIA director Leon Panetta. 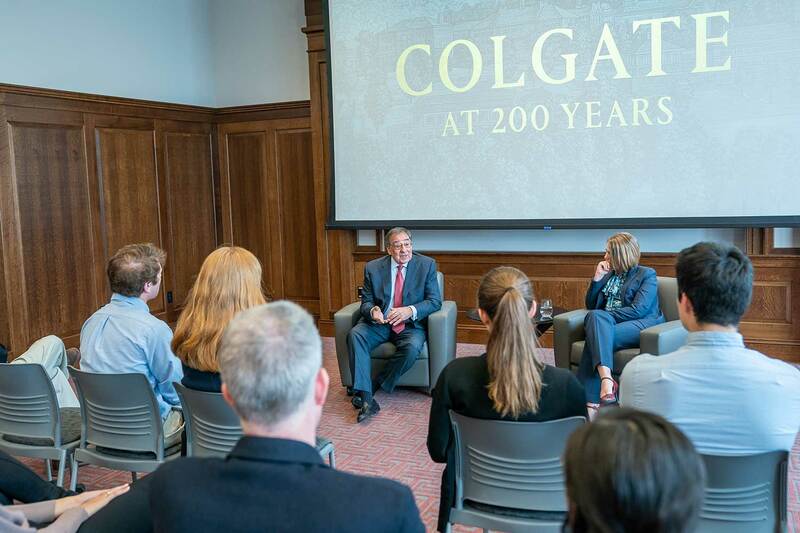 The series is one way in which Colgate engages with the world and introduces students — future leaders — to pivotal international figures. 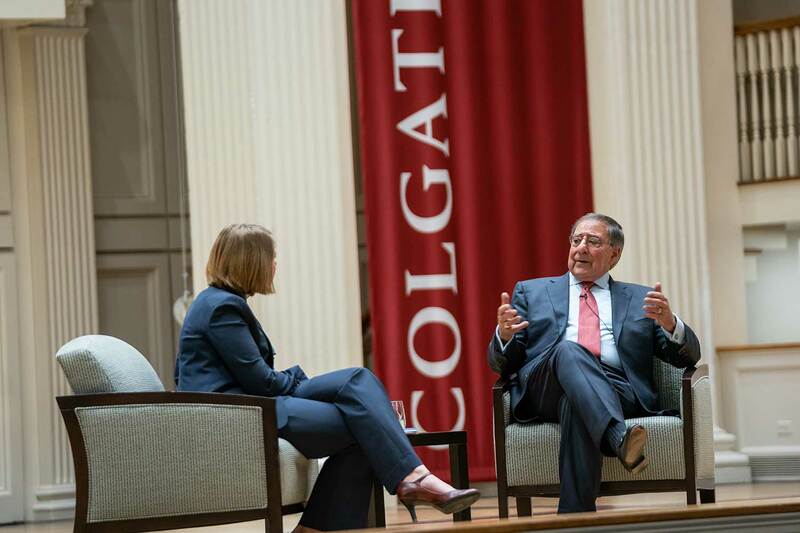 Panetta described his path to leadership and outlined the challenges facing America today. A rising America would feature a strong economy, driven by creativity and innovation. It would be populated by citizens with an appreciation for national service, and it would represent its values through leadership abroad. 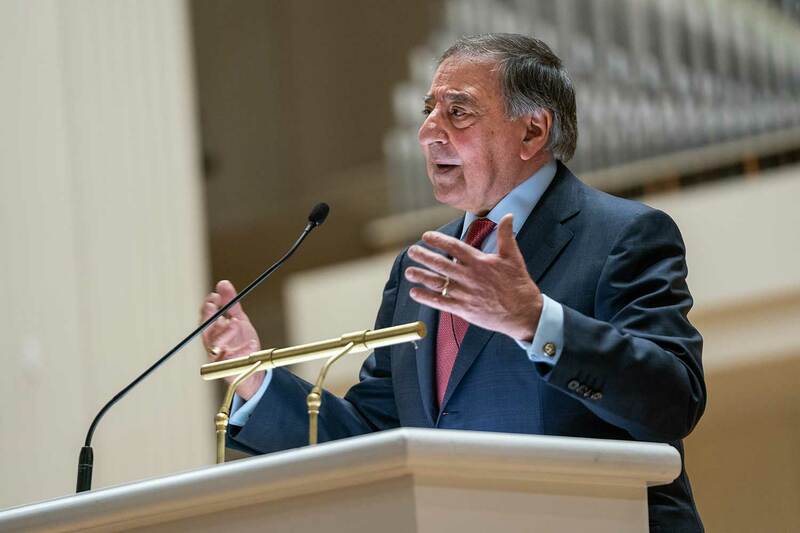 A declining America would lurch from crisis to crisis, “divided by our hates and our fears and prejudices, unwilling to work together, unwilling to face the truth, frustrated by political gridlock, unable to protect our most basic freedoms,” Panetta said. 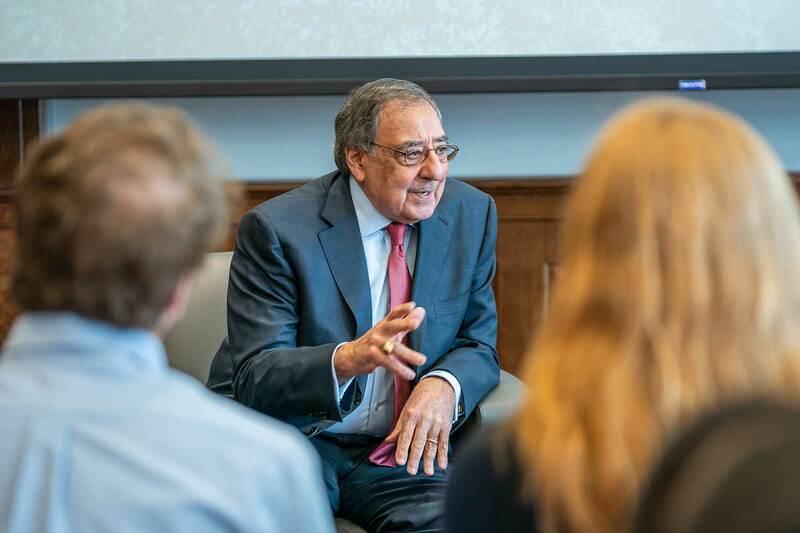 Following the lecture, Assistant Professor of Political Science Danielle Lupton asked Panetta to talk about the balance between morality and national security, between technological progress and social responsibility. She also asked the co-founder of the Panetta Institute to advise students on how best to enter public life. Earlier in the afternoon, while Panetta met for discussion and dinner with students and faculty in Benton Hall, Colgate presidents past and present gathered in Love Auditorium to reflect on leadership at the University. The panel included President Brian W. Casey, alongside former presidents Charles Karelis, Neil R. Grabois, and Thomas Alva Bartlett. Moderators were former interim presidents Jill Harsin, Thomas A. Bartlett Chair and professor of history, and Jane Pinchin, Thomas A. Bartlett Chair and professor of English emerita. Two additional presidents — Rebecca Chopp and Jeffrey Herbst — weighed in via video message. 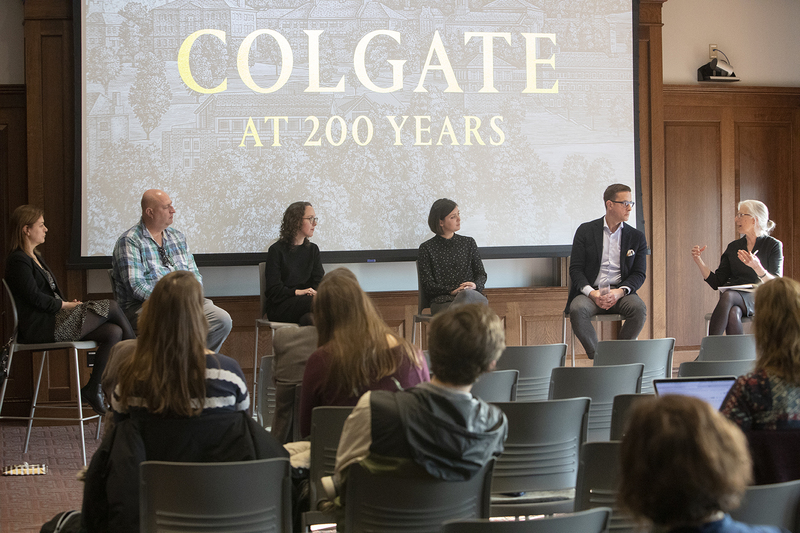 Alongside conversations about global and campus leadership, the community also celebrated Colgate’s ambitions to lead in the arts and in entrepreneurship. The weekend’s calendar included numerous performances, museum tours, and a panel conversation featuring Colgate community members in the arts. Participants in the Thought Into Action incubator pitched their ventures to potential investors on Saturday, and Colgate’s Alumni Council recognized Robert Johnson ’94 as Entrepreneur of the Year, with the award to be conferred officially during reunion this May. Demonstrating leadership on the field — and rounding out the weekend’s packed agenda — women’s lacrosse dominated Lehigh in a 16–4 victory at Beyer-Small ’76 Field on Saturday.